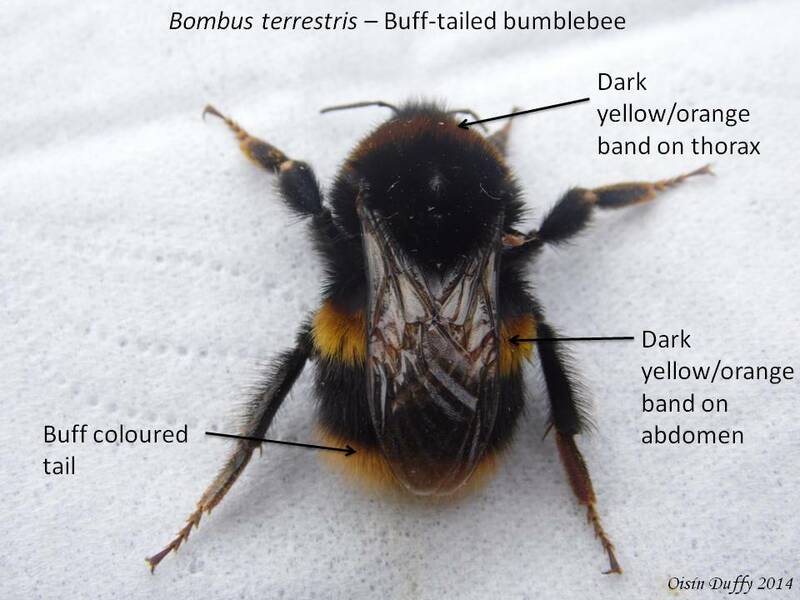 Bombus terrestris (Queen) – (Also known as the buff-tailed bumblebee) is a large bumblebee and can be commonly seen in a variety of habitats, gardens, hedgerows, meadows etc. Queens can be seen quite early in the year and may also be seen during the winter (which is unusual for bees). The species has two dark yellow/orange bands, one on the thorax and one on the abdomen, the species (as the name suggests) has a buff coloured tail. The tail colour can vary from an almost orange to a “dirty” or off-white colour. Bombus lucorum (Queen) – (Also known as the white-tailed bumblebee) is a large bumblebee and similar to B. terrestris can be found in most habitats. The species has two lemon yellow bands, one on the thorax and one on the abdomen. The tail colour (again, the name is a giveaway) is white. B. lucorum has a characteristic “clean” white tail, which is very distinctive. 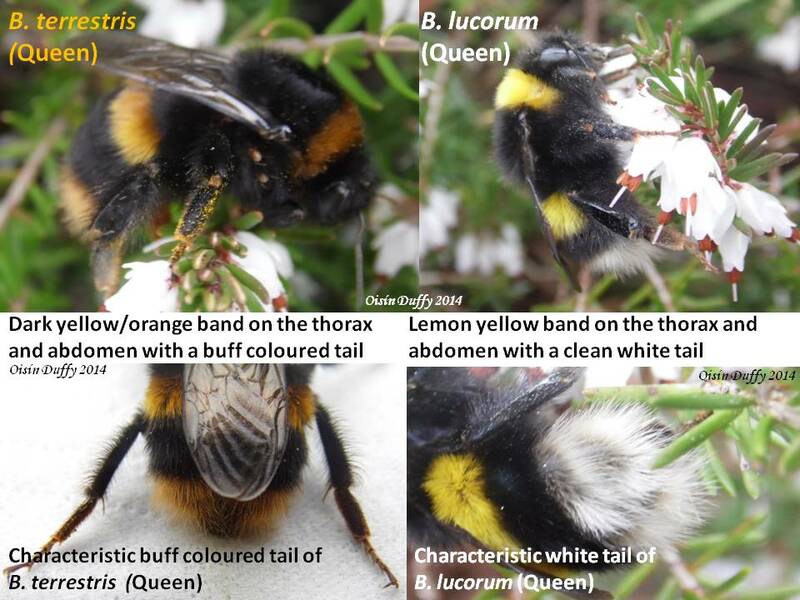 Both B. terrestris and B. lucorum are quite similar and this can cause confusion when trying to identify the species. While the bands of both species are different colours (dark yellow/orange – lemon yellow respectively) the tail colour is generally the most noticeable difference between the two. This approach is suitable for determining the identity of Queens. 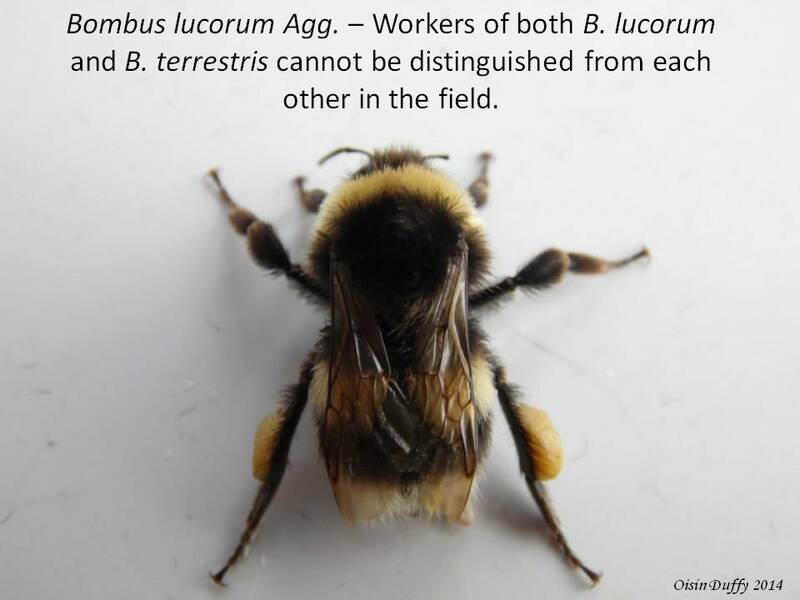 The workers of B. terrestris and B. lucorum are a different story altogether and cannot be told apart in the field (DNA Analysis is required). If being recorded these workers should be listed as Bombus lucorum aggregate (B. lucorum agg).